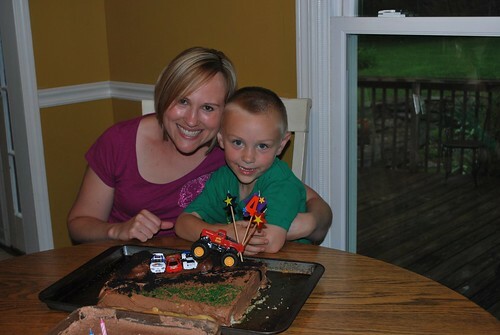 I can't believe my little boy is 4 today. We had a party for him on Saturday night. I know last year I said that this was going to be the year that Miller gets a class party, but obviously I lied. I decided a couple of weeks ago that we were going to do a family only party. Miller requested a bowling party so we convinced the family to go bowling with us. 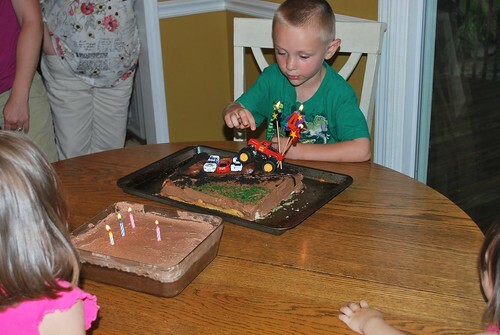 Then we had everyone back to our house for pizza and cake. I made 2 cakes from scratch. I am not the best baker, so this was quite an accomplishment for me. I have issues with following the directions exactly, which is pretty important when you are baking. So I made sure I had ALL the ingredients and actually followed the directions. It worked pretty well. Mitch once again did the decorating. My sister-in-law's birthday was yesterday so we celebrated her birthday too. She requested this cake. I like to think it is healthy. Ah...happy birthday! 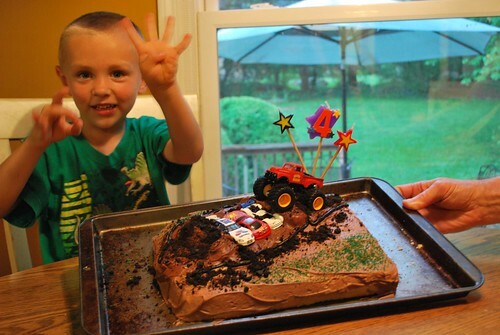 I think 4 is a terrific age - I hope you have a stellar year! You are so great to bake two cakes. Happy Birthday, Miller!!! Wishing you a rockstar year. 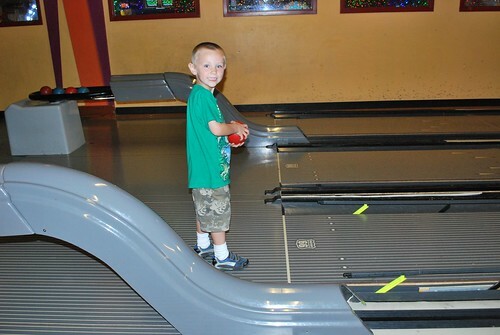 Watching little kids bowl is a hoot, isn't it?! And you have plenty of company in the not-much-of-a-baker camp - but the cakes look great! Happy Birthday! And what a cool looking cake! Do you taste the coconut milk in the other one? It looks like a great recipe. Happy birthday Miller!! Looks like a great time for him, regardless of no class party.